Yes, here are the rivers Danube and Ganges, also looking away from Borromini's church facade. But here's the real story: check out the very tip of the tail on the dragon. 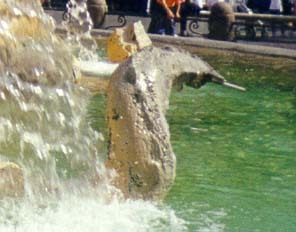 The tip of the tail is seen against the green of the water, directly below the people seated in front of the café to the right. Here you can see it up close for yourself. Note the metal re-bar portruding from the tip of the tail. 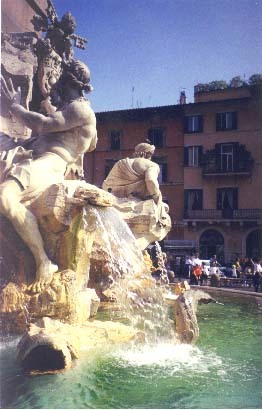 One day, a man walked up to this fountain, and, feeling hot and sweaty as people in Rome are wont to do in the summertime, he felt that the fountain's water would be just the thing to cool him off and refresh his state of mind. After sufficiently bathing himself in the waters of the fountain, he decided that he needed to rest ... no, no, you're getting ahead of me, please wait patiently ... so he seated himself upon the tail of Bernini's dragon, which promptly failed under the man's weight and broke off, exposing the structural rebar underneath. See the narrow bar sticking out of the tip of the tail? Bernini didn't design it to look like that from the outside. ...who then promptly turned around and sued the Comune of Rome for not providing a safe bathing environment. Thus proving that American tourists are not the only ones ruining famous tourist spots around the globe. And now you know ... the REST of the story!